With 9 heart impressions, you can make a muffin perfect for everyone at the table. Make decorative cornbread, and other tasty treats with it. Cast Iron cooks best. The even heat control allows for a perfect bread crust every time. Pre-Seasoned and ready to use. 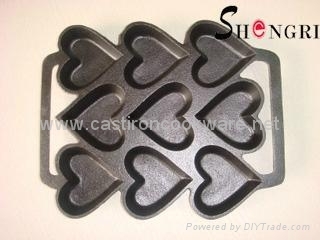 Advantages︰ Healthy cast iron materials.